Is ProHeart 6 the right choice for my dog? 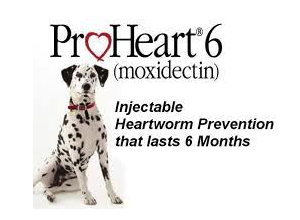 Only your veterinarian can determine if your dog is a good candidate for ProHeart® 6 (moxidectin). Generally, ProHeart 6 is for healthy dogs 6 months and up. No more monthly doses to remember … no more giving pills, chewables or applying monthly topical medication for heartworm prevention. Peace of mind … know that your dog is protected especially in areas where infection is common. FDA Approved … Proven safe and effective in dogs. Safe … for pregnant and lactating females, breeding males, and ivermectin-sensitive collies. How does ProHeart 6 work?